Since NPR exists for most people as an audio-only experience, Mugs Of NPR offers listeners the opportunity to add a visual component to the radio shows they listen to while stuck in traffic every day. Here, along with all those mugs, are pictured the hallways, desks, cubicles, break rooms, and even bathrooms of National Public Radio. (According to this Tumblr, an NPR bathroom is a “frequent scene of mug dereliction.”) In a way, it humanizes public radio. These shows may seem erudite and intellectual, but they are produced by perfectly ordinary people in perfectly ordinary surroundings. Just like anyone else, the men and women of NPR are tossing back mug after mug of coffee in an effort to make it through yet another working day. Occasionally, though, the tedium is relieved by the appearance of a celebrity. For instance, there was that day when Peter Frampton strode into the office. 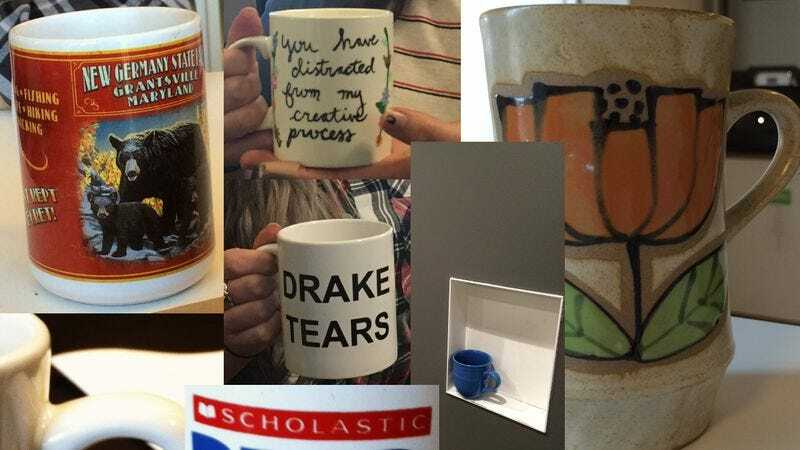 The Mugs Of NPR archive stretches all the way back to April 2014, and updates are frequent, so true NPR superfans could presumably spend hours browsing through this impressive collection of mug shots. If nothing else, it offers the reader a virtual simulation of what it might really be like to work at a public radio station.